A flag for La Mancha – a territory nowadays included in Castilla-La Mancha – was proposed in 1906, representing the four provinces of La Mancha: black for Toledo [possibly after its black eagle? ], red for Cuenca, blue for Ciudad Real and white for Albacete. Juan José Sánchez Badiola, Los rabales de Babel y otros ensayos sobre los separatismos españoles, Madrid, Vision Net, 2004. Also, [frz81] makes no reference to the yellow star referred to image by Eulogio Navarro. At least the Ciudad Real city arms probably looked different in the early 20th century. Source: Ramón José Maldonado y Cocat, El Escudo de Ciudad Real, Excmo. Ayuntamiento de Ciudad Real, 1970, available online here. 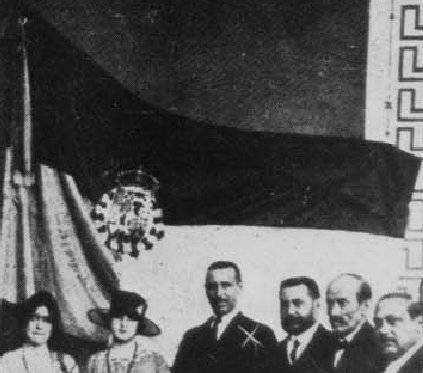 According to Fuster Ruiz 1981 [frz81] the later Albacete flag was embroidered in 1919 by teachers of Albacete's Escuela Normal de Maestras and lost after the dissolution of the Centro Regional Manchego ca. 1923; possibly the arms – a high quality embroidered version of the royal arms – were cut out and reused elsewhere (pp. 21-22). The photographs in [frz81] (scan here) appear to show the quarters not as 1/4th of the flag each, but offset to the hoist. On this scan the flag "dips" near the hoist, so the first quarter might not be as short as it would appear at first sight. But if the quarters are all the same size, then the flag as shown in that scan must be ca. 1:2 in ratio, which would have been absolutely unusual among Spanish flags. Another photograph in [frz81] shows a good view of the coat-of-arms (scan here), which appears to be a mistaken version of the royal arms – also shown in some early 20th century paintings of the royal standard, for example one mentioned in Calvo and Grávalos 1983 [cag83] – , where the royal crown is replaced by that of the heir prince, thus with only four arches – of which three visible – as in the current Prince of Asturias' standard. The photographs in [frz81] show the arms approximately as high as 1/3 the flag's height.